Now that the American Promise part of Rozalia Project’s season is over, we want to tell the story of our re-power, the decisions, the reality and partners who made it happen. Previously we had a 1986 Perkins diesel. It gave us no more than 5.5 – 6 knots (mostly with the current behind us), using 2.5 gallons per hour or more. It filled the boat with fumes, most noticeably from hydraulic fluid. It bellowed black smoke on start-up, if it started at all, as the engine spent nearly all of last year with a 60/40 chance of starting without needing to use all of the boat’s battery power. We had no-compromise requirements and some compromises we’d be willing to make. Safety was no compromise – we needed reliability and range. Next came environmental considerations: improved efficiency and reduced emissions. Then, human comfort: reduced noise and fumes and finally, features such as the ability to use biofuels and a seamless switchover without needing to rewire the whole boat or learn entirely new procedures. • This summer we averaged 8-9 knots under power, using 1.8-2 gallons per hour. • We do not have a boat filled with fumes. This engine has an 80% reduction in nitrous oxide emissions over a Tier 2 engine. • We do not belch black smoke upon startup, nor at any time. This engine has a 150% reduction in particulate matter over a Tier 2 engine and 1,000% improvement from our 1986 diesel. • The engine starts every time we turn the key. • We cannot hear the engine while on deck from the bow to aft of the mast. We don’t need to shout when under power, either below or in the cockpit. •We outran two fast moving thunderstorms, arriving at our mooring with time to spare for one that slammed us with 60 knots at the masthead. •We were always able to maintain control and precision in the swift-moving waters of our homeport (the back channel of Kittery Point off the Piscataqua River). • We did not need to rewire the entire boat. • We did not need to learn any new procedures. We check the oil, turn the key, check the exhaust and go. The maintenance schedule is reasonable and easy to follow. Our home boatyards (Kittery Point Yacht Yard and Maine Yacht Center, who did the installation) are certified to work on the engine. 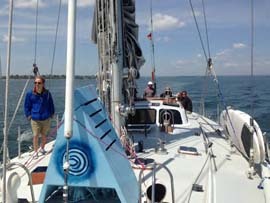 • Using a combination of power and sail and the generator for house bank power, we traveled 170 miles over three days for $61 in fuel, including conducting four surface tows under power. Additionally, once we are out of the break-in period we will be able to start running on biodiesel, all the way to B100. We could even be eradicating ocean pollution while running on restaurant waste in the form of veggie oil. American Promise is the first vessel in North America to install this Tier 3 Steyr engine. We showed the engine off all over the Gulf of Maine and in Boston, and we’re spreading the word that a switch to a Tier 3 marine diesel is a reasonable and accessible change. Rozalia Project is grateful for support from the State of Maine Clean Marine Diesel Program with the Maine Marine Trades Association, 11th Hour Racing, Kilroy Realty Corporation, Maine Yacht Center and Kittery Point Yacht Yard. We will have a wider and wider effect as we share information with everyone who loves the ocean and wants to do their part to keep it healthy. Rozalia Project is 501(c)(3) non-profit, whose mission is to find and remove marine debris, from the surface to the seafloor, through action, technology, outreach and research. For more information, visit rozaliaproject.org.